Below you can find some basic information about major white matter tracts in the human brain. Click here for 3D visualizations of the major tracts via Three.js, XTK, and Sketchfab. Click here for a 3D animation of the white matter tracts, showcasing how they look individually and how they all fit together. The Callosum Forceps Major and Callosum Forceps Minor are white matter tracts that are part of the corpus callosum. The arrows on the image to the right indicate the Forceps Minor (top) and Forceps Major (bottom) on a dissected brain. The Forceps Major connects the two occipital lobes in the back of the brain. This bundle crosses the midline at the splenium of the corpus callosum. The Forceps Minor connects the lateral and medial surfaces of the frontal lobes. This bundle crosses the midline at the genu of the corpus callosum. The Cingulum Hippocampus white matter tract is also known as the Parahippocampal Cingulum. 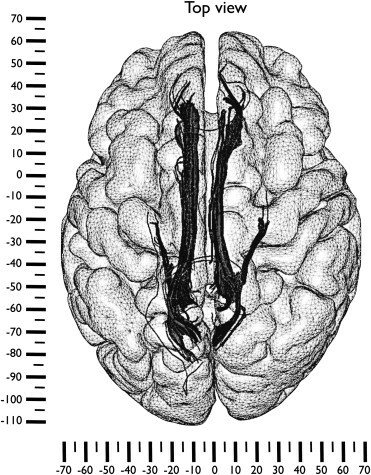 This tract is a subdivison/segmentation of the Cingulum white matter bundle. It runs from the medial temporal lobe to the parietal and occipital lobes. The cingulum is a collection of white matter fibers projecting from the cingulate gyrus to the entorhinal cortex in the brain, allowing for communication between components of the limbic system. It forms the white matter core of the cingulate gyrus, following it from the subcallosal gyrus of the frontal lobe beneath the rostrum of corpus callosum to the parahippocampal gyrus and uncus of the temporal lobe. ​The Corticospinal tract carries information about movement from the cortex of the brain to the spinal cord. The fibers of this tract connect the Primary Motor area, Premotor area, and Supplementary Motor area of the frontal lobe to the spinal cord. The Inferior fronto-occipital fasciculus (IFOF) connects ipsilateral (same side) frontal, posterior parietal, and occipital lobes. This tracts helps connect the auditory and visual association cortices with the prefrontal cortex. Catani, M., & De Schotten, M. T. (2008). A diffusion tensor imaging tractography atlas for virtual in vivo dissections. Cortex, 44(8), 1105-1132. The Anterior Thalamic Radiation connects the anterior and midline nuclear groups of the thalamus with the frontal lobe through the anterior thalamic peduncle and the anterior limb of the internal capsule. 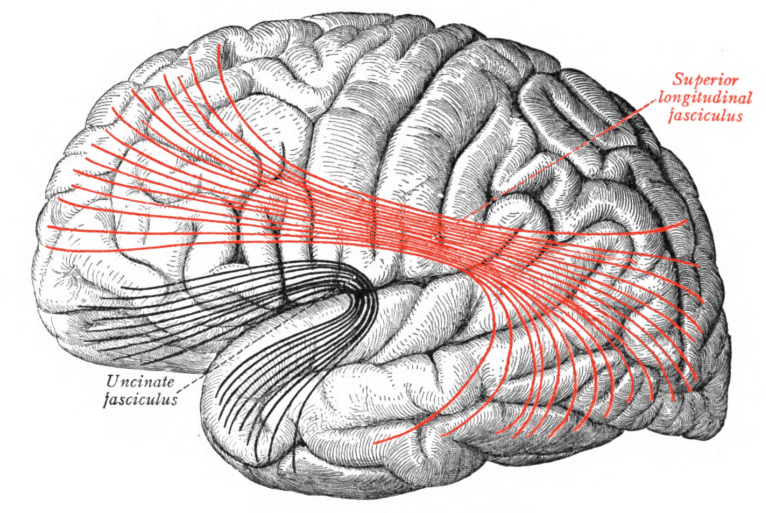 The superior longitudinal fasciculus connects the frontal lobe to the cortex of the occipital and temporal lobes. The inferior longitudinal fasciculus connects the temporal lobe and occipital lobe, running along the lateral walls of the inferior and posterior cornua of the lateral ventricle.